I finally had a decent showing of participants for this desert activity over Thanksgiving weekend. Our meeting place I declared to be the Furnace Creek Death Valley Visitor Center at twelve noon, Thanksgiving Day. We had to leave Wednesday. I took one person, and we had a cold night camping somewhere in the Owens Valley. As we came to Lone Pine in the morning, I couldn't resist going a short way up the portal road. I snapped a photo of Lone Pine Peak and Mt. Whitney. We had the whole morning to enjoy the highly scenic drive east on Highway 136, then Highway 190. I stopped many times for photos. The group began showing up about the time we arrived to Furnace Creek, about noon. Soon, there were thirteen of us. I gave out copies of the itinerary, which didn't go over too well with some. I had lately, then, attended various Angeles Chapter peak climbs, and like the way they have a hard plan, on paper. Everyone then knows what to expect, and thus what clothing and/or equipment is needed. And when I say, peak, that means the top! Some local chapter leaders will vaguely refer to climbing, and never commit to doing anything. "Maybe," usually means that you won't get to the summit. We car caravanned south on the main park road. Our first major stop was Badwater. This is the lowest point, 282 feet below sea level, in the Western Hemisphere. Some of us walked out onto the alkali flat. The exact low point is indistinct. 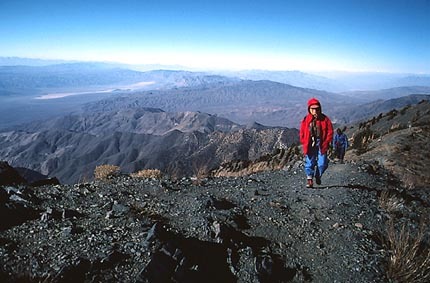 One of the peaks we were to climb, Telescope Peak, rose across the western skyline. Many famous photographs have been taken here. Motoring on south, we crossed over Jubilee Pass, then came to Salsberry Pass. We parked on the shoulder next to the sign. It was mid-afternoon. Our first peak, Sheephead Mountain, lay a mile or so to the southeast. The gain on this is about 1,000 feet. We readied for this easy hike, then started out as most were ready. Some climbers trails were followed, then there was a short, class 2, scramble to get to the top. It felt really great to make our first peak climb for this trip. There are many, named hills or peaks in this area. Few park visitors get the chance to explore here. I had once scheduled a multiple peak climb in the area, but only had one call. The weather forecast was iffy, so I opted to delay this trip for another, better time. Generally, each peak chosen would require only a relatively easy effort. We would climb two or three peaks a day. Back to this trip, the late afternoon view was hauntingly beautiful. Marriage vows would be appropriate for this kind of locale and mood. The long shadows stretched across the Ibex Hills to the southeast. We found an old tobacco can that held the register, placed by the San Diego Chapter of the Sierra Club. Everyone signed in. I allowed an hour for the return. We hiked together for awhile, then, as independent minds will do, people began setting their own ways. The sun was setting, and it began to get dark. A leader sometimes has to let self-preservation instincts to take hold, and hope that everybody is competent enough to find their way back. I could see there was a problem with some. We all drove in the night to Tecopa Hot Springs. There, we soaked in the warm water with other patrons. This is a mandatory, no-clothes, gender segregated, county park facility. A stipulation by the former owner wrote this provision into law. After we had a good soak, we left to drive back to Shoshone, CA. At the Crowbar Cafe, I knew that the holiday was acknowledged and celebrated. Aside from two hikers who preferred to rough it, we all had an excellent, traditional turkey dinner, with all the trimmings. I think everyone was surprised and pleased at this bit of civilization, so remote and far away from home. I knew a good camp spot in the Greenwater Valley a few miles away. The stars were out, and a faint glow in the sky to the east reminded all that Las Vegas was a hundred miles away, by car. I had a good sleep, and mentally prepared myself for a hard climb tomorrow. Getting up at about 5:30 a.m., we motored back in the pre-dawn darkness to Shoshone for an early breakfast. I had plenty of coffee, with sausage and eggs. The Crowbar Cafe now no longer opens at 6 a.m., which I have missed. When everyone was finished, we car caravanned north on Highway 127, past Eagle Mountain, then turned left on Highway 190. There was a sufficient shoulder for us to park off the pavement. Pyramid Peak waited to the northeast. I led hikers to a rally point a half mile from the cars. There, we ready hikers waited for the others to catch up. We weren't going to fool around on this peak! I chose a likely ridge for our ascent. Searching for a use trail, I found little trace. But, we could visually determine that this route would go. Headed up with a large group makes for delays, due to the variations in pace. No one wanted to race ahead, as they knew that would be considered as leaving the group, and they might choose the wrong way. Stay with Pete! A photo op presented itself to me as the women clambered together over a small crag. The light was definitely desert. We continued up, with different rocks presenting themselves. I had to take a slower pace. This peak was not the one for people to separate from the group. Close to the summit, I let two faster hikers go ahead and recon for a better route. They simply went ahead and ignored me, not passing any audible information. Seeing them go, I knew that the route was O.K. There, I found a use trail which completed the remaining few hundred feet to the top. We did it! The view was unreal. The fantastic geology of the then National Monument called for telephoto pictures. The top of the High Sierra was visible a hundred miles away. Our cars were visible as tiny specks far below. I urged people to don warm clothes for a summit stay. There was a stiff breeze. Some garbage was tossed, in an apparent act of malice, hate, or defiance. I had to restrain another leader from climbing down on class 2 to pick it up. There could be an injury! I reasoned, too, that the offender might develop a conscience, and come back up here to clean it up. Thusly, no harm done by the Club execs. We had people eager to go back down. I had to restrain a partial sign-off, then finally, it was time to climb down. Hikers were tired. We found a scree run, but to no time advantage. We had to wait for the tired ones, who moved slowly. I shot more photos of adjacent geology. There were fine rock formations, presently, then, outside the park boundary. They made a good photo. 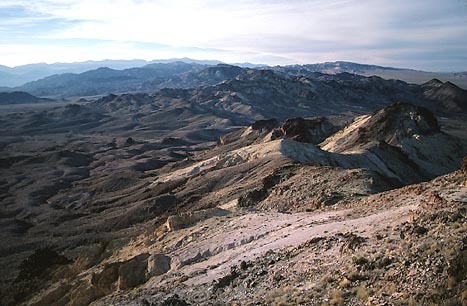 These would be protected in an expanded park, with the 1994 desert protection legislation. I sensed a revolt coming. One couple of hikers wanted to go a different way. It was clearly wrong. I told them they could go, with our responsibility to them then clearly absolved. I had to tell them they would probably die, from the cold night and no water. That might have led to an argument, since some may have been eager to take sides against me. But, the wisdom of staying with the group leader, and the correct way back, fortunately prevailed. We came down to the playa, and had a long walk back across the flats. It was beginning to get dark. The choice for the revolt-route would have left them far from the cars at this time. Don't trust participants to have survival gear and a good, working flashlight. While terrain may be passable on a moon-lit night, on trail, it is death, with no moon, in the desert! Unseen spines and thorns will massacre a hiker unable to see his or her way! We agreed to meet, this night or the next morning, at Wildrose Campground on the other side of the Monument. Some would drive straight there, while some of the others went to Furnace Creek for dinner. I was yelled at for "showers." "Go back to the hot spring, or use facilities here, if you can find them," I responded. I wondered if they realized that this is a desert, and water is scarce. While backpacking, we don't have a chance to wash up everyday. Soap pollutes the backcountry, so we don't encourage it. Incidentally, I think that there are showers at the Stovepipe Wells campground. After a three hour wait, I got my restaurant meal. The nights were long, and I didn't have much else to do. The next day, we mostly met at Wildrose Campground, then car caravanned again to the trailhead at Mahogany Flat. We were to do Telescope Peak. I was able to drive the posted 4WD road with my passenger wagon. Part of my fun, then, was to safely take a worsened road, in a careful driving feat, with "inappropriate vehicles." The seven mile, one-way, trail hike was an easy day, for me. It was my second ascent. The group wanted the highest peak. It became windy and freezing cold. Parkas and jackets were donned. The group posed for a photo. We were all having a great time. The current conditions didn't stop anyone from achieving this mountain top. Some snow lay about the final sections of trail before the summit. We completed the climb after some four or five hours. It was too miserable for most. I enjoyed the strong, cold wind, but others took shelter in nearby tree groves, or inside a space blanket. Finally, as hikers began to want to leave, we departed the top. Back to the vehicles well before dusk today, we drove back down to the charcoal kilns. We met our hiker that had done Wildrose Peak instead. This was enough climbing for some. It was a long drive home. The rest of us agreed to meet the next day, at the junction of U.S. 395 and Highway 120 east, for a fourth peak. Two cars convened for a short climb of Crater Mountain, the highpoint of the Mono Craters. We drove east on 120 to take a dirt side road into the world's largest Jeffrey Pine forest. I almost got stuck in loose sand. Lucky for me, I am an experienced driver. Our climb took an hour. I navigated better than I thought. The highest crag is on the north side. The view of Mono Lake is good. Some dirt bike tracks marred this scene. We could hear some buzzing off in the distance. Returning to the cars, we had only a two hundred or so mile drive left to get home. My total stats were some 8,700' gain over 29 miles. Only two of the others completed all of this with me. The weather had been fine all weekend. If you liked climbing desert peaks, this was Heaven. Banned shortly by the local chapter, we continued our Thanksgiving desert climbs privately for a few years, then the remainder lost interest. It doesn't get around what great trips these are. We saw a vast expanse of desert, which, for the educated eye, is quite a diverse place. Many geology oriented hikers will note many kinds of rocks. To date, I have now completed over 800 peak ascents since the local chapter ban. It is with my great and heavy regret that more local, wilderness and fun loving, Sierra Clubbers miss our great, safe adventures. I heard of outings disasters, after some were given the go-ahead by the local chapter, and failed attempts on the efforts of others. Apparently, some are so bad and embarrassing that they have to be covered up. The first chapter fatality has since occurred now on a hike. More malicious purpose at work?